The Ulster Secondary Schools Athletic Association held their annual District Cross Country Championships on the 25th January at the University Of Ulster in Coleraine with pupils from local schools competing for the chance to progress to the Ulster Championships. Although representing their schools on this occasion Springwell Running Clubs Junior Section were to feature strongly in the championships, claiming 5 of the 10 titles available. In the Intermediate boys Andrew Gordon (Coleraine Grammar) ran 12.22 to win the race, while in the Intermediate Girls Hermione Skuce (Coleraine Grammar) also took first place with a time of 8.42. The Junior Boys race saw Matthew Beveridge (Coleraine Grammar) won in a time of 7.48 with Cormac Carr (Loreto College) 6th in 8.35. In the Junior Girls category Cara McLaughlin (Loreto College) finished 7th in 8.25 and Lauren Thom (Loreto College) 13th in 8.58. In the Minor age groups Niamh McGarry had an excellent run, finishing 2nd in a time of 6.27 while in the Minor boys Patrick Fell finished 21st. The Mini Girls Category saw another great performance from Sophia Coyle, (Loreto College) to win in a time of 5.58. These strong performances at District Level meant that all of the Springwell RC Junior section qualified to race, either as an individual or as part of their school team at the Ulster Schools Cross Country Championship which took place at the Belfast Playing Fields in Mallusk on the 21st February. With all those who had qualified from their respective District Championships at Mallusk, competition was intense but the Springwell RC Juniors rose to the challenge, producing some great performances. In the Senior Girls Race Niamh Carr ran strongly to claim 2nd place with a time of 8.28. Matthew Beveridge, in the Junior Boys had a race long contest for a podium place and was only pushed into third in the closing stage of the race finishing 3rd in a time of 11.17. In the Intermediate Boys Race Andrew Gordon was involved in a battle for the podium places before unfortunately having to retire injured. Senior Girls – 2nd Niamh Carr 8.28, 9th Ellie Beveridge 9.04, 14th Rebekah Hunter 9.15, 22nd Molly Brennan 9.33, 35th Aine McKinney, 49th Abigail McBroom. 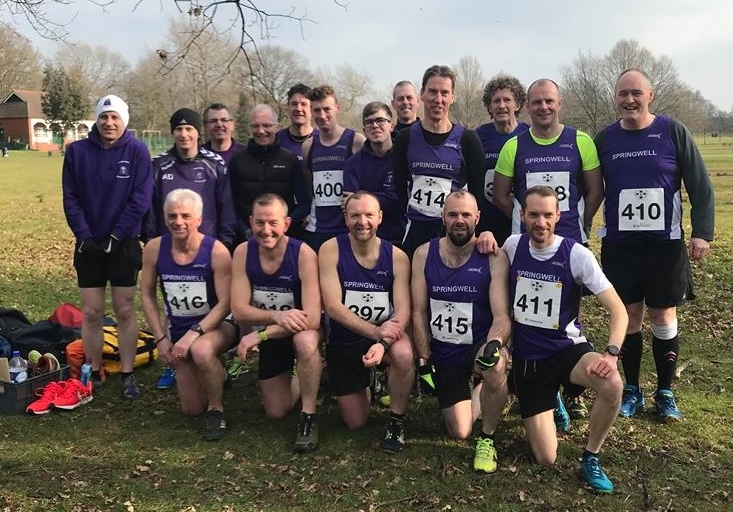 Northern Irelands largest urban park, Lurgan Park in Lurgan was the setting for an exciting afternoons racing on Saturday 24th February with a closely contested NI & Ulster Cross Country Championship. In bright but cold conditions almost 200 runners took on the 12km, 6 lap course around the park. From lap 2 onwards it was to be an intense three way battle for the title between Mark McKinstry (North Belfast Harriers), Neil Johnston (Springwell RC) and Declan Reed (City of Derry Spartans) with three time runner up Mark setting the pace for most of the race and Neil and Declan close behind. In the closing laps it was Declan, the 2015 Champion who took control of the race and dominated to win in a time of 41.40. Mark, runner up for the fourth consecutive year, finished 2nd in 41.53 with Neil 3rd in a time of 42.02. It was to be a double celebration for Declan as City of Derry Spartans retained the team title with six finishers in the top eleven places. 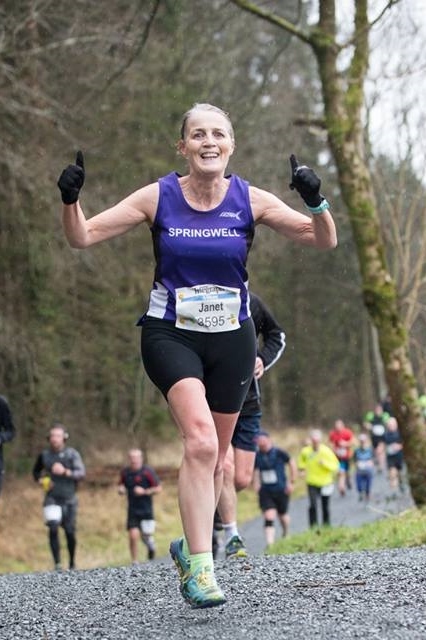 Saturday 24th February saw the last event of Management Company, Born 2 Runs ‘Run Forest Run’ series with the 5 & 10k races at Castlewellan Forest Park. Springwell RC had three members at the event. In the 5k race Stacey Montgomery finished 204th in 45.07 while in the 10k race Andrew Kincaid ran 54.04 to finish 223rd and Janet Patrick a 55.52 finishing 254th and 2nd in the F55 age category.